The UT-Ethernut Interface adds Ethernet connectivity to the parallel bus system designed for the Raizen lab at the University of Texas. The system is comprised of an embedded Ethernut computer and an interface circuit with FIFOs and a clock input. Data is loaded into memory over TCP/IP and then clocked onto the parallel bus from the Ethernut's memory, through the FIFO buffers. We have some pictures of an assembled system. Source Code for Ethernuts running an interface circuit (zip). Needs Nut/OS to be compiled. This can be unzipped directly into the application tree once Nut/OS is installed. Includes working code for Digital Output boxes (with two Digital Output circuits) and Analog Output boxes (with two Analog Output circuits). Library files for communicating with Ethernuts running interface circuits (zip). Includes a sample program and some utilities. The library and sample programs are all written in Perl. Analog Output Circuit manual, including schematics (pdf). This file was originally here. Digital Output Circuit manual, including schematics (pdf). This file was originally here. DDS Circuit manual, including schematics (pdf). This file was originally here. The WebTC is a 8 channel Ethernet-enabled thermocouple monitor. Source Code for Ethernut running a WebTC (zip). Needs Nut/OS to be compiled. This can be unzipped directly into the application tree once Nut/OS is installed. The RF amplifier is a relatively cheap amplifier with >30dB of gain capable of up to 1.5W or 32dBm. They use Freescale's MHW1345 linear amp modules, a replacement Motorola's popular and discontinued CA2830. We put 6 in a box with some fans because they do get quite hot. The RF preamplifier was designed at UBC to give a little extra power after the DDS boxes and before the RF amplifier. It can be used with a number of Mini-Circuits monolithic amplifier ICs for gain from 8 to 16dB. The RF Function generator is a relatively inexpensive RF source built before we built the DDS boxes. Based on Mini-Circuits Voltage Controlled Oscillators and Voltage Controlled Attenuators, these generators include external modulation inputs for frequency and amplitude and a dedicated RF switch (below) per channel. We have versions centered at 80MHz and 130MHz with output power of up to +5dBm. Osmond Quartz File for a power distribution circuit board layout (osm). This is useful for connecting the RF function generators and the RF switches to the same power supply in a box. 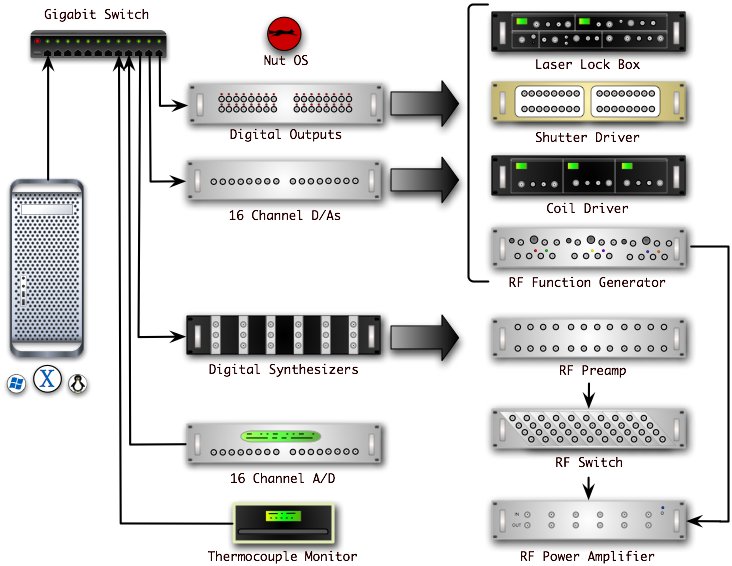 The RF Switch has 10 channels with ~5ns switching driven by TTL. Isolation is better than 40dB and insertion loss is less than 1dB. Uses minicircuits MSWA-2-20 which works well from DC to 2GHz. The ZOINKS project consists primarily of contributions from the Steck Lab at the University of Oregon and the Madison Lab at the University of British Columbia. Some of the electronics are based off of designs by Todd Meyrath and Florian Schreck. Information on these designs and the UTBus can be found here. Another document, written by Raymond Gao (formerly of the Madison lab), which describes some more information and goals of the ZOINKS project is available here.